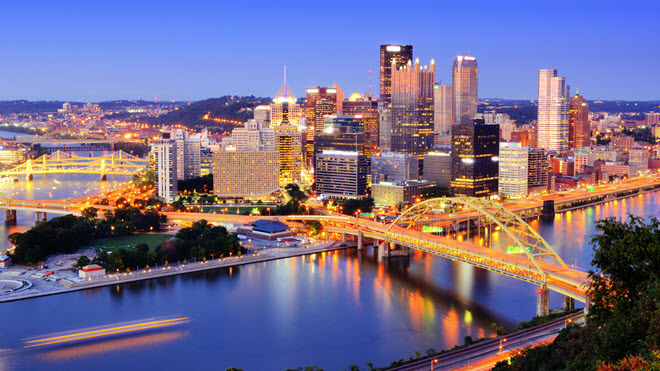 Pittsburgh, formerly known as a steel town, is home to a rich culinary history. It’s also known as “America’s Most Liveable City”, according to the Places Rated Almanac. Various types of American food were born here, such as the Big Mac, famous Primanti Bros. sandwiches, Klondike bars, and ketchup. It is also home to the Phipps Conservatory and Gardens, Carnegie Science Center, and many restaurants and coffeehouses. The city’s diverse ethnic background offers cuisines for any taste. Pittsburgh’s low cost of living as well as its ever-growing restaurant and hospitality scene makes it a great place for aspiring chefs to live and work. Pittsburgh’s culinary schools produce many fine chefs and culinary artists. Let’s take a look at a few of the best places to learn the trade. The Le Cordon Bleu Culinary Institute is an accredited school founded in 1986, and is one of the top culinary schools in the world. They offer programs in the culinary arts, patisserie and baking, and hospitality and management. Culinary Arts Students will use a hands-on approach in small classes to learn classic culinary skills combined with modern innovations. Students are taught the ropes of American and regional food, international cuisine, baking and pastry arts, and food science. Students of Patisserie and Baking will learn the skills to make Artisan breads, chocolate/sugar showpieces, European pastries, and much more. The Hospitality and Restaurant Management program teaches students practical and theoretical management skills, wine studies, hospitality business law, and all other aspects of managing a restaurant. In addition to these classes, students will be taught about sanitation, food chemistry, dietetics, nutrition, and kitchen management. They offer an online program for a Bachelor of Arts for students who have already earned an associate’s degree in culinary arts, patisserie and baking, or hospitality management. This will allow students to continue their education and move into a more advanced field. Founded in 1921, the Art Institute of Pittsburgh has revolutionized the art and design fields. The school has recently moved from its historical building to a new location where everything is newer and better equipped than before. They offer degree, diploma, and certificate programs in the culinary field. Culinary arts students will learn the basics of knife and hand skills, then move into specialized areas such as baking and pastry. They will be taught advanced food preparation techniques as well as timing and preparation. Baking and Pastry students will be taught specialized pastry techniques, baking science and theory, classical European Cuisine, chocolate, and many other courses. They will also take a Baking and Pastry Internship and Portfolio course to prepare graduates for interviewing. Culinary Management and Hotel & Restaurant Management focus on teaching students to train and manage in culinary processes. Business and culinary classes prepare students for food and beverage operations, hospitality, accounting, and human resources. Students at the Art Institute of Pittsburgh will receive a well-rounded education and a great start to beginning a career in the culinary arts.